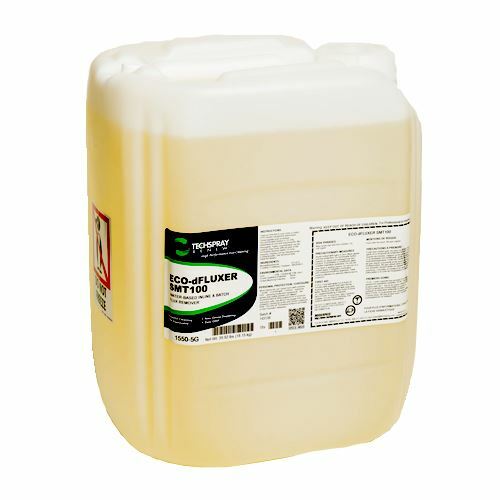 Eco-dFluxer SMT100 is a water-based, environmentally friendly cleaner that is designed to work in both inline and batch cleaning equipment. An optimal combination of solvents and saponifiers lowers surface tension for penetration under low stand-off s, and powerful cleaning action to remove all flux residues. Effective on a wide variety of solders and fluxes: lead, lead-free, aqueous, RMA, no-clean, and new halide-free fluxes. High compatibility with common PCB metals & plastics. Eco-dFluxer SMT100 is highly filterable with long bath life. Moderate pH avoids many disposal issues. High performance cleaning gives you brilliant solder joints and allows you to increase dilution, increase line speeds, reduce waste water, decrease cost per board, and most importantly… eliminate field failures due to ionic contamination! 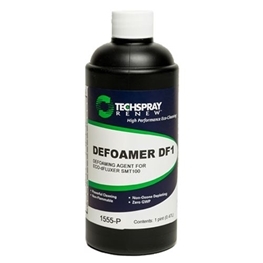 Eco-dFluxer SMT100 is fully compliant with California CARB requirements. Also compliant with European REACH and WEEE initiatives. It does not contain RoHS restricted substances, SVHC listed substances, or halides.